There have been many survival books about being alone in the jungle, being stranded, being a castaway. Robinson Crusoe, Kensuke’s Kingdom, Running Wild, even The Jungle Book in its own way. But DJ Brazier has written his with such raw passion, such gruesomeness, such a sense of grit and determination that it stands out as one of the most visual books for young teens this year. Sam wakes up in hot sand near the Amazon River. 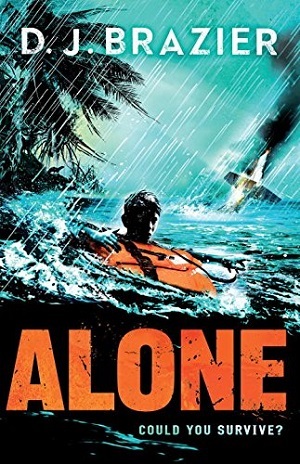 The small plane that was carrying him and his father home from the holiday of a lifetime has crashed in the jungle, and Sam is left alone, and terrified. He has to recall all the survival techniques he learned watching Bear Grylls, as well as using a fair bit of common sense and instinct to survive – and as the days move past and no one comes to rescue him, Sam has to make some terrifying decisions to make it back to human civilisation alive. Brazier’s text never lets up for a second. As if the reader too is stuck in the jungle, alert to every slight insect scratching, every rustle of leaf, every movement of the river. It is raw, and visceral and gripping. Some of the scenes are not for the faint-hearted – Brazier describes the fauna of the jungle in incredible detail – from the leeches to the ants. Popping a spot in the jungle and seeing worms crawling out is just one of the many highly memorable episodes in this gruesome tale – but it doesn’t feel superfluous – just real, and highly visual. There is no sentimentality either – Sam has to show bravery beyond the normal to survive each day, let alone to reach human contact. There is a huge amount of detail, including how to make a fire without matches, but it never bores for a second – the reader roots for Sam as they would their favourite football team. His character grows during his adventure, as he finds incredible inner strength, but it’s also a sign of great writing strength on the part of Brazier to have just one character throughout the whole book and no dialogue with another, and yet still remain gripping and tense. Sam expresses his emotions, sometimes with swearing, which again isn’t gratuitous because I think he really would in the situation, and also with such pathos that the reader feels a real affinity with him. In fact, quite often throughout the book he fails in his attempts to do things – he can’t make fire easily (who could, without matches), and he has to learn new ways to eat – fishing isn’t as natural for humans as for a heron. What’s more this failure brings out his self-deprecating humour. During the book he makes friends with a baby otter, and builds a relationship that gives him the comfort of contact with another living creature, and this too is not trite but handled well. It’s a completely engrossing book, with great detail about animals and survival, which will appeal also to non-fiction fans. It’s the sort of book that you pull out the bag and wave at those students who don’t think they like reading. They won’t put this one down. Above all, it ends in precisely the right place. Age 12+ years. You can buy it here.